The Right Price: Are Pretium Resources and Detour Gold for Sale? The gold market is in a funk. And if you have an internet connection, you don’t need me to remind you. The gold price can barely keep up to the $1,200 mark and the trend doesn’t look too friendly. Managed money short positions continue to hit record bearish positions in the weekly commitment of trader’s reports. 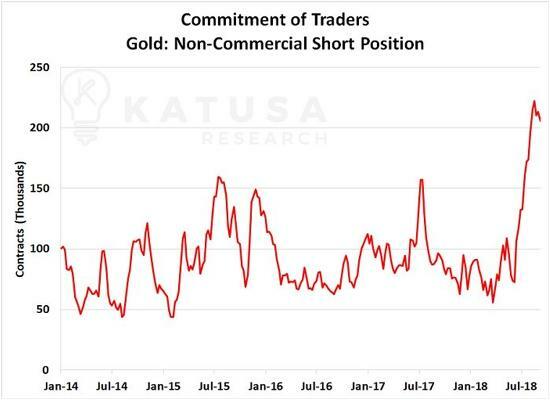 Below is a chart showing the current short position for non-commercial short speculators. Small exploration companies are looking to cash up on any market momentum. And tax loss season this year could be the most brutal since 2012. So with all this negativity why am I excited? Two-fold. 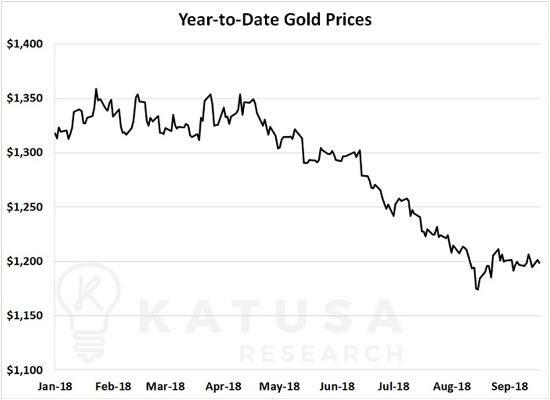 One – The NYSE Arca Gold Mine Index rose by double digits – 8 of 9 times – in the 3 months following extreme pessimism in gold market sentiment like we’re seeing today. And two – Because there could be plenty of incredible companies and assets for sale for dimes on the dollar. And that always has my attention. So in this week’s edition of Katusa’s Investment Insights, we will detail two companies that could make headlines with any merger or acquisition activity. 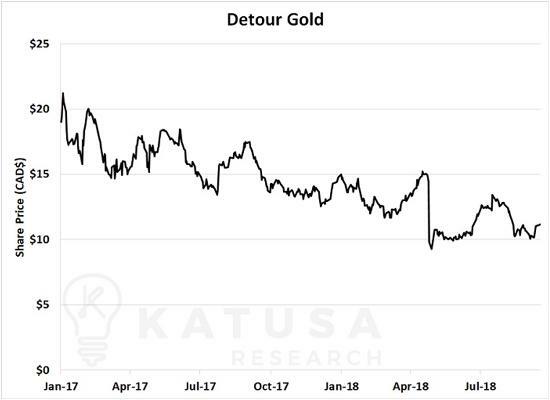 Is Detour Gold too Cheap to Ignore? Detour Gold (DGC.TO) is a Canadian company that owns the Detour Gold Mine. It is one of the largest producing gold mines in Canada and the company’s sole asset. The company’s share price has been under siege, dropping from CAD$20 per share to CAD$11 per share in the span of 18 months. Its major institutional investors, Paulson & Co and Van Eck, are throwing in the towel. The pair of institutions is pushing for either a change of company directors or the exploration of a sale to a major gold producer. (Side note: I’ve used that line many times over the past 3 months when talking to different company management teams and board members). This year, Detour Gold released an updated life of mine schedule with higher than expected production costs. Based on these production figures and gold at $1,250 per ounce, the Net Present Value of free cash flow is around CAD$3 billion. Currently, the company has an enterprise value of CAD$2.1 billion, which means Detour is trading at a 30 percent discount. However, with gold weak and struggling to get above $1,200 per ounce, Detour has a lot of room to drop. And it could be a great candidate to watch for during the upcoming tax loss season. The Detour Gold Mine is slated to produce upwards of 600,000 ounces of gold annually for 18 years. The Achilles heel of the mine is that the production ore grade will average 0.97 grams per tonne over the life of the mine. At the same time, cash costs will be $843 per ounce. This heavily ties the value of the project to the price of gold. 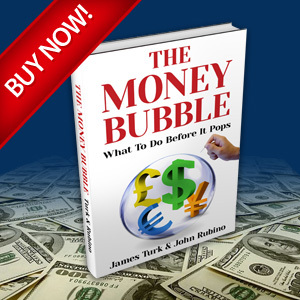 It makes it a great mine to own in a strong gold market, and a disaster to own in a weak one. And right now, things are shaky in the gold market. Volume is low, sentiment is low and the gold price is struggling. That said Detour Gold has been and will continue to be on the radar of all major gold producers. The suitor list for a company like Detour is quite small. Companies like Newmont or Goldcorp are always going to be in the mix for world-class assets. Agnico Eagle and Yamana could do another 50-50 joint acquisition, like when the pair acquired Osisko for $3.9 billion in 2014. I do not see Barrick or Kinross getting involved, given the state of their balance sheets. Barrick has been hammered by the markets for bad acquisitions. And shareholders would be very nervous about a big high-cost producer like Detour. Barrick wants big assets like Detour, but I’m just not sure the big institutions will support Barrick management on such a tough project at the current gold price. An interesting idea would be if Agnico Eagle and Yamana put together a joint bid for Detour. If they were successful in buying Detour Gold, Agnico and Yamana could then spin out Osisko and Detour into its own new company. With a pair of free cash flow generating assets, the spinco (spinout company) could be a solid dividend payer that Agnico and Yamana could be major shareholders in. That would unlock considerable value for both companies. It would be a very creative deal. And it’s something I would not bet against. Pretium Resources (PVG.TO) has long been one of the market darlings of the sector. The flagship asset for Pretium Resources is an asset called Brucejack, which is located in British Columbia, Canada. Since the 1960s, the project has been a focus of exploration by numerous companies. Brucejack is famous for its bonanza grade gold. In 2009, Pretium discovered the Valley of the Kings zone. One of the first drill holes hit 1.5 meters of nearly 17,000 grams of gold per tonne. That’s a massive hit. Pretium has delineated one of the highest-grade gold projects anywhere in the world. Today, Brucejack hosts 8.7 million ounces of proven and probable gold reserves at an average grade of 14.66 grams per tonne. The company has spent well over $100 million in exploration and engineering studies and another $800 million in initial capex at Brucejack. Based on the 2014 feasibility study, the project carries an NPV of over $1.5 billion (using $1,100 gold and a 5 percent discount rate). 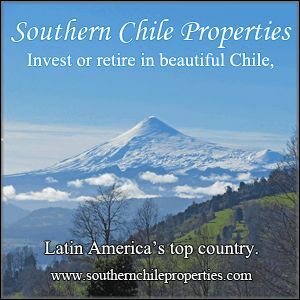 Using $1,250 per ounce gold and proven and probable gold reserves, the NPV of the project is $1.9 billion. This generates a base case NPV of CAD$14.20 per share. Pretium is trading in the $10 per share range after a recent sharp climb following a short and distort campaign. Currently, Pretium is increasing gold production towards its goal of 500,000 ounces per year. Once at full production, the mine will produce an average of 500,000 ounces of gold annually for 18 years. At 500,000 ounces per year, the project will rank 29th in the world in terms of production. And it will be the highest grade mine out of any of the world’s 30 largest gold mines. 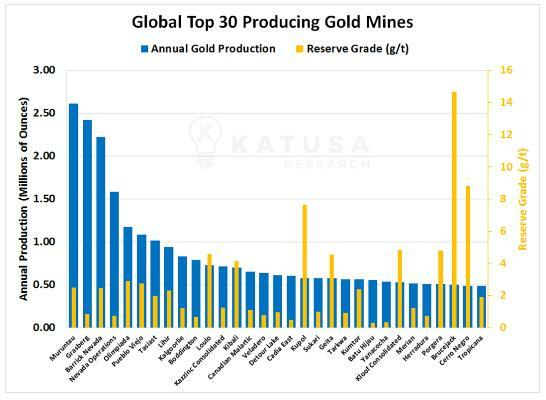 Below is a chart comparing the annual gold production (in blue) and the reserve grade (in yellow) of the top 30 producing gold mines. Pretium management has done an incredible job bringing the mine to production. But the biggest knock on the mine is the erratic distribution of gold, which will be the main focus of any major looking to buy out the deposit. First off, everything is for sale at the right price. The pipeline for high-quality gold mines that are located in safe jurisdictions (i.e., non-AK-47 nations) is quite slim. 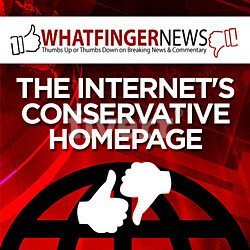 (Note: for more on my AK-47 indicator – read this). https://katusaresearch.com/use-ak-47-indicator/ Even more so once you remove state-owned assets and mines already owned by majors. Removing those mines, Pretium would rank second in the world based on its steady production of 500,000 ounces per year. The only larger mine that is not run by a major and is located in a non-AK47 jurisdiction is Detour Gold. It too, though, has its own set of issues, as outlined above. 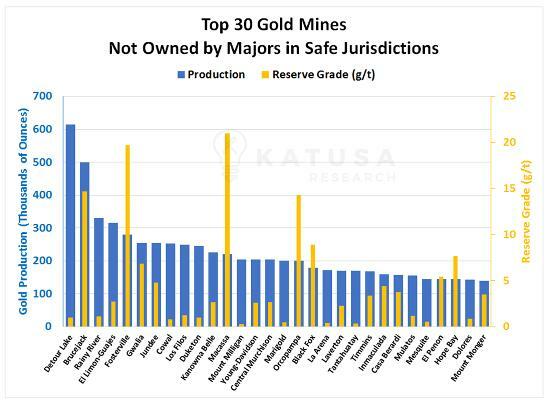 Next, you’ll see a chart showing the production and reserve grade for the top 30 mines not owned by majors and located in non-AK47 jurisdictions. Think of the list of potential acquisition targets like stacked dominos. Once one falls, they all begin to fall in succession. For example, let’s say the Detour Gold domino falls. Pretium will become the only company with a single mine producing more than 500,000 ounces per year. If Detour is acquired, the target on Pretium’s back gets even bigger. 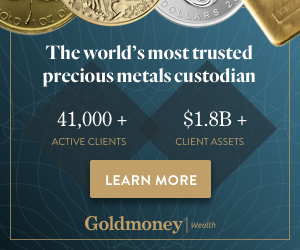 There are four potential bidders for Pretium: Newmont, Goldcorp, a consortium between Agnico Eagle and Yamana (like the Osisko deal), and Kirkland Lake. This type of large-scale operation only fits the mold for a few senior producers. Goldcorp and Newmont have strong enough balance sheets to take on the company. But Canadian underground mining does not fit the bill for Newmont. A company I think that could make a big splash is Kirkland Lake Gold. I speculated in a previous edition of Katusa’s Investment Insights that If Kirkland Lake Gold is Hunting Juniors like an Alligator – Who is on Its Radar?. Kirkland Lake has the cash and the market cap to make a purchase like this happen. And buying Pretium would double the company’s production and turn the company into a major gold producer. Here’s something to watch. If Pretium continues to prove its engineering and geological modeling works for this deposit and the share price continues to stagnate, I think a suitor will capitalize on the opportunity. Click here for more of Katusa’s research.